In today’s show we talk about a fresh and unique project coming from the Technical University of Munich under the supervision of Prof. Martin Buss. 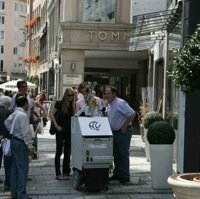 The Autonomous City Explorer or ACE, is a fridge-sized robot whose mission is to get around the city of Munich, but instead of using GPS or an in-built map, the ACE asks pedestrians for directions! Armed with stereo-vision cameras, a touch screen, and an inquisitive personality, ACE roams the city of Munich in search of Marienplatz, one of the city’s downtown pedestrian squares. Our first guest and one of the leaders of the ACE project, Dirk Wollherr, tells us about the design and goals of the ACE robot. Our second guest, Astrid Weiss from the University of Salzburg, tells us about the sociological aspects of human-robot interaction and what it takes to make a robot that people actually want to communicate with and help find its way. 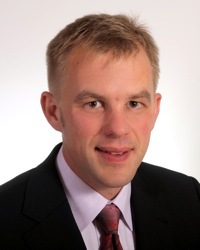 Dirk Wollherr is a senior researcher at the Technical University of Munich. Along with Kolja Kühnlenz, he’s in charge of the technical aspects of the ACE robot, including the sensors used for navigation and interaction with passerbys and the algorithms used to analyze gestures of human beings. Wollherr describes the intricacies of making a robot understand what humans perceive so naturally, such as pointing in the direction of a target. He also talks about the navigational challenges involved in traversing busy streets and ever-changing environments. 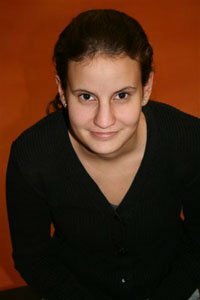 Astrid Weiss is PhD student at the HCI & Usability Unit of the ICT&S Center at the University of Salzburg where she studies Human Robot Interactions under the supervision of Prof. Manfred Tscheligi. With her background in sociology, she’s become an expert in analyzing the impact of humanoid-like robots on society, their acceptance by humans and how usable they are. She was present during the ACE tests in Munich, interviewing people who helped the robot and getting their first impressions. She’ll be telling us why humans help the robot, and what are the important features and limitations of the current interactions with passerbys. Weiss is currently engaged in the EU-project ROBOT@CWE which aims at investigating concepts needed for humans and robots to work together in various environments. You can find many pictures of this year’s Maker Faire along with more information on the Dustbot and the Roadmap for US Robotics in the Robots Forum.